Try Branded Clipboards for a Change and See How That Makes Your Name a Heavier Hit in the Pharmaceutical Industry! That’s right. Clipboards. Branded clipboards. You can utilize them as incentives, as a THANK YOU for doing business. Send them out as gifts to all the doctors in the field operating within your region. Let your brand stand out even more beyond that of the product you just sold. The sky’s the limit for such things as that as you continually promote and nourish your brand, staying a cut above the rest of the competition. So why not take advantage of what the medical field needs at the very simplest level and offer those gifts on top of the premium products and services you provide? You eliminate the competition even more than you already do. Stay ahead of the game. Expand your regions and territories. And you never, ever lose any revenue and profit. And it’s because of the investment you’ve made in branded clipboards from BRAVA Marketing. Check out our design selections and see which one may fit you. Remember: you’re a professional. Let your service speak for you, and let these branded clipboards end the conversation the right way. 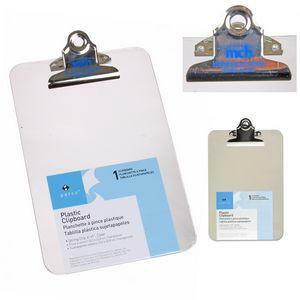 Contact us today, and be sure to check this link out as well for more ideas branded clipboards can bring.